A Calgary Vampire Facial is a way of extracting platelets and collagen growth factors from your own blood and using them as a dermal filler – that is, as a substance injected under the skin of the face to fill out wrinkles so as to provide a more youthful appearance. Blood is drawn from the arm and spun in a centrifuge to separate the platelets, which are then injected back under your skin along wrinkles. With our mesotherapy injector, we can perform targeted microneedling on your face while simultaneously injecting the PRP just under the skin. The whole treatment takes less than an hour to complete. Are Vampire Facials Right For You? This is a minimally invasive, all natural, skin rejuvenation treatment. With our experience using platelet-rich plasma (PRP) for hair restoration, we are now able to extend the benefits of PRP to the face. Vampire facials can be used not only in the effort to rejuvenate the skin on the face but also to reduce hypertrophic scars, stretch marks and certain types of hair loss. If you want to make it a whole spa day, ask us about the Botox and Latisse treatments that we provide. What Does A Vampire Facial involve? The patient’s blood is drawn and placed in a centrifuge to separate out the platelet-rich plasma (PRP). Then the PRP is used along with microneedling to stimulate your body to create collagen that can improve skin texture, acne scarring, fine lines and skin tone. What Is A Vampire Facelift? 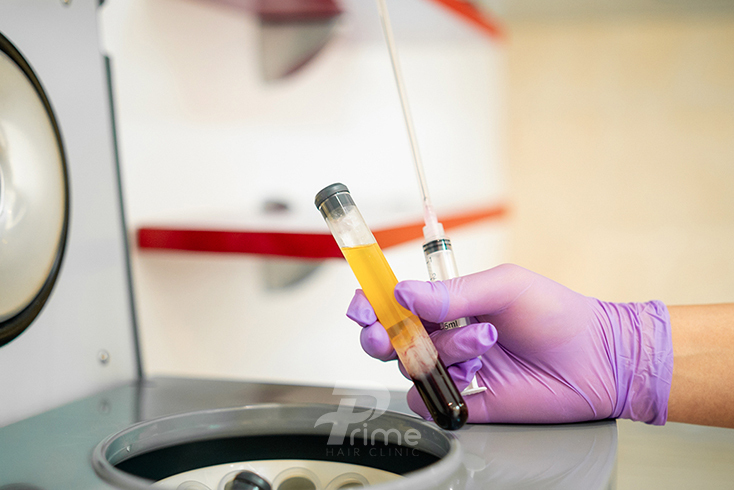 This procedure involves drawing the patient’s own blood, placing it in a centrifuge to isolate the platelet rich plasma (PRP), which carries stem cells and regenerative growth factors, and re-injecting this “liquid gold” into lines, wrinkles and areas of laxity in a targeted approach. It may or may not involve the use of hyaluronic acid. We are happy to offer both options for you at Prime Hair and Skin Clinic. What Are The Most Notable Vampire Facial Benefits? This treatment is primarily used to address skin texture and stimulate collagen and elastin formation, which is important because we stop producing our natural collagen after the age of 25. It is also a great remedy for acne or surgical scars because it breaks up scar tissue bands and stimulates deeper healing leaving your skin looking and feeling smoother, brighter, tighter and more youthful. Do I Need More Than One Session? Desired results may be achieved in just one visit; however, these results are not permanent. Every individual is different, but generally, results can appear immediately and improve over several weeks. These results have been reported to last up to a year.